ORIENTAL rugs have long been valued for their artistry and durability, not to mention their association with taste and gentility. But these days you don’t need to be a Brahmin to buy one. There is a glut of affordable Oriental rugs on the market, thanks to the end in 2000 of a 20-year embargo on Iranian textiles and an expanding range of other floor covering options. Discerning quality can be tricky, because of the many subtleties in materials, design and craftsmanship. But if you use your senses, you can find a rug that not only suits your style but is also a sound investment. But before you let a dealer unroll a single rug for you to examine, keep some basic guidelines in mind. Decide how much you want to spend and where you want to put the rug. If it is destined for the dining room, you’ll want it to be bigger than the table, and you may want a dark color that camouflages spills. And just so you don’t come across as a rug rube, call the rug a “carpet” only if it is more than 6 feet long. Your next decision is whether to buy a modern or antique rug. Though there are exceptions, the best-quality rugs are either very old or very new but made in the old tradition, most dealers and collectors say. “There has been an effort in the last few years to return to the way rugs were made a century ago,” said Mark Hopkins, president of the New England Rug Society, a group of rug scholars and connoisseurs. That was before the widespread use of chemically treated wool, synthetic dyes and mass production techniques discouraged weavers’ creativity. “Some of the new rugs are like the antiques in that they are unique, one of a kind, works of art,” said Mr. Hopkins, a retired advertising executive who has a large collection of Oriental rugs. Prices vary according to design, provenance and condition, but you can get comparable antique and new room-size Oriental rugs for $2,000 to $10,000. 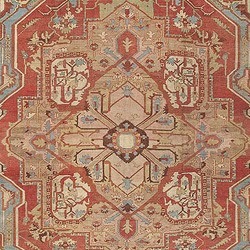 Rare collector’s rugs, like a 12-by-14-foot Sultanabad circa 1870, may go for $100,000 to $200,000. When evaluating a rug, look for warm colors that change hue when viewed from different angles. Avoid rugs with brash, one-note colors, like taxicab yellow or mailbox blue, as those can indicate synthetic, chemical dyes rather than natural dyes derived from plants and insects. “The naturally dyed rugs are more aesthetically pleasing and more valuable,” said George Anavian, a rug dealer with showrooms in Santa Fe, N.M., and Manhattan who also teaches a rug appraisal course at New York University. And natural dyes do not run the way some synthetic ones do. Dampen a white handkerchief and rub it over the pile to check for color fastness. Next, turn the rug over. Don’t worry about counting knots per square inch because the weave’s tightness does not always indicate value. More important is that the weave has some irregularity in the knotting. If it’s flawless, it may not be handmade; machine-made rugs are anathema to collectors. “Often the most valuable and charming rugs are ones that have imperfections” – when the top and bottom border designs don’t match, for example, because the weaver could not see across to repeat exactly what had been done at the other end of the rug, Ms. Piper said. Historically, the great carpet-making areas have been Iran, Turkey, Turkestan and the Caucasus. But you can also add Afghanistan, Pakistan, Nepal, India and China to the list. Look at the back of the rug to check for repairs – and to see if the rug may have been cut down from a larger size. Tip-offs are lines that look like seams running through the design, or obvious overstitching. “It’s not necessarily bad if the alterations are well done, but you want to know what you are getting,” Mr. Anavian said, because such modifications can reduce the value. Check whether the colors on the back match those on the front. If not, it may have been chemically “aged” to appear antique. You can also check for such aging by separating the pile and looking for dark roots – like those of a bleached blond overdue for a hair appointment. THE most durable and valuable rugs are usually made of wool and should feel soft, springy and lustrous. If a rug is frizzy or coarse, the wool has probably been scalded and mechanically spun, which strips away its protective fibers and lanolin, said George Jevremovic, president of Woven Legends, a rug importer in Philadelphia. “If it’s spun by hand, the wool keeps its natural Scotchgard against stains and wear,” he said. You should also feel for uneven or thin areas in the pile – signs of wear or moth damage. These may not be apparent to the eye because they are often painted over. Fold the rug back and forth and listen for any creaking or cracking, indications of dry rot. And give the rug a whiff. A funky smell can signal rot or mold. Dealers and appraisers say well-made Oriental rugs increase or at least hold their value over time, and collectors say that some rugs are worth 10 times what they were 20 years ago. But nothing is certain.